Well this week I spent some serious money to upgrade The Eye and I came across this post about how a guy who has been traveling non-stop for 12 years obtained permission to live in Romania. And now I can stay in this beautiful country for as much as I want for one year. I’m a temporary resident of Romania, a country that offers an excellent standard of living at a very attractive cost, with friendly people all around, wonderful food, mountains, the Black Sea coast and endless other regions to explore, high quality wi-fi (helps with work!) and a location that is perfect for exploring Eastern Europe, while being able to fly anywhere in the world from nearby Istanbul. I decided to live in Bucharest and I couldn’t be happier. I’ve just about run out of ways to express in my own words why I live in Romania and why all the people that I know here and meet here all agree that it’s a wonderful country. So it’s kind of nice to hear from a professional traveler, a guy who has been in far more countries than I, who are de ales so to speak, knows what life is like around the planet and has chosen Romania anyway. And for those of you reading this who are non-EU citizens and looking to find a legal way to live in Romania, click on the link for details because there are several good ideas (including in the comments). Thanks for the mention here and I am absolutely another huge fan of this country! In my 12 years of travel this is the first time I’ve found a country that makes me want to stay in one place instead of continuing to bounce around the world. And I guess I got lucky with this small residence card. I know that when I went to pick it up, everyone else in line received the same thing so perhaps they have changed the format completely. 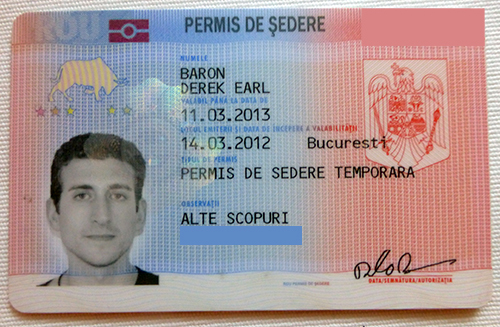 That card looks much nicer (and more robust) than the DIN A5 piece of paper that “allows” me five years of residency in Romania.. Your document is likely a registration certificate issued by the Romanian Immigration Office (I think) for UE/EFTA/Swiss citizens. I always wondered why the heck they chose to print such an important document on a mere slip of paper that one could only too easily misplace. I have a residence permit and it’s…size A4!!! Impossible to take anywhere unless you walk around with a brief case. I never could understand the logic behind it!